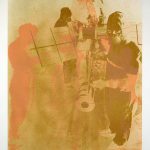 Visiting artist and alumnus William Hall will hold an exhibition walkthrough in the Sarah Moody Gallery of Art, Tuesday, November 7 at 10:00 a.m. Hall will talk about prints in the current show, Contemporary Consolidated: Selections from the Permanent Collection. As a former master printer at the esteemed Pace Editions for three decades, Hall is intimately familiar with the printing process, the artists and many of the prints on exhibit in this exhibition. During his time at Pace, Hall worked with internationally acclaimed and lesser-known contemporary artists including Donald Baechler, Richmond Burton, Chuck Close, Jim Dine, Tara Donovan, Helen Frankenthaler and more, representing a broad range of printmaking processes. 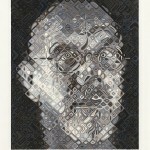 A highpoint of Hall’s career was assisting master printer Aldo Crommelynck for ten years at Pace. Crommelynck is best known for his extensive collaboration with Pablo Picasso. 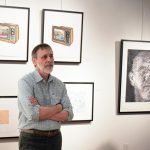 Originally from Red Level, Alabama, William Hall received a Bachelor of Fine Arts degree in painting from UA in 1973 and a Master of Fine Arts degree in painting and printmaking from the University of Texas in 1976. 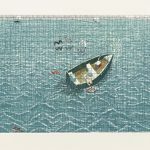 He moved to New York in 1982 and began his career as a printmaker and collaborative printer at Robert Blackburn’s Printmaking Workshop. Four years later, he established his own studio, NYLE Press, and then joined Pace Editions in 1988 until his retirement in 2015. 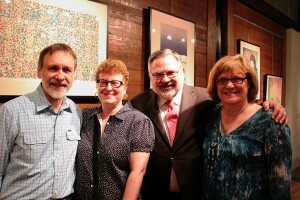 Pace is one of the largest publishers of contemporary fine art prints in the United States. The William and Sara Hall Collection includes more than 475 signed, limited-edition artists’ prints that the Halls collected over the years. The Halls donated the $1.5 million collection to UA’s Sarah Moody Gallery of Art in 2014. 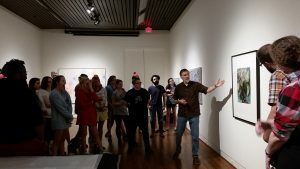 For more information about The University of Alabama’s programs in studio art and art history, go here: https://art.ua.edu/academics/graduate-programs/art-requirements/. Information about visitor parking is available here: http://bamaparking.ua.edu/visitor-information/. Parking is free on campus in a legal space after business hours. Contact the gallery at (205) 348-1891 or go to http://art.ua.edu/gallery/smga/.